I'll admit, before her collaboration with Topshop, I had never heard of Louise Gray. Since educating myself, i've learnt that she is renowned for her love of colour, texture and all things fun and this is definitely echoed in her makeup collection. An eclectic mix of nail polishes, eye colours and lipsticks (With a gorgeous pastel brush set thrown in for good measure!) I was instantly drawn to the bold colours - though I must admit the purple and pink eye cream duo's are a bit too 'out there' for my liking. 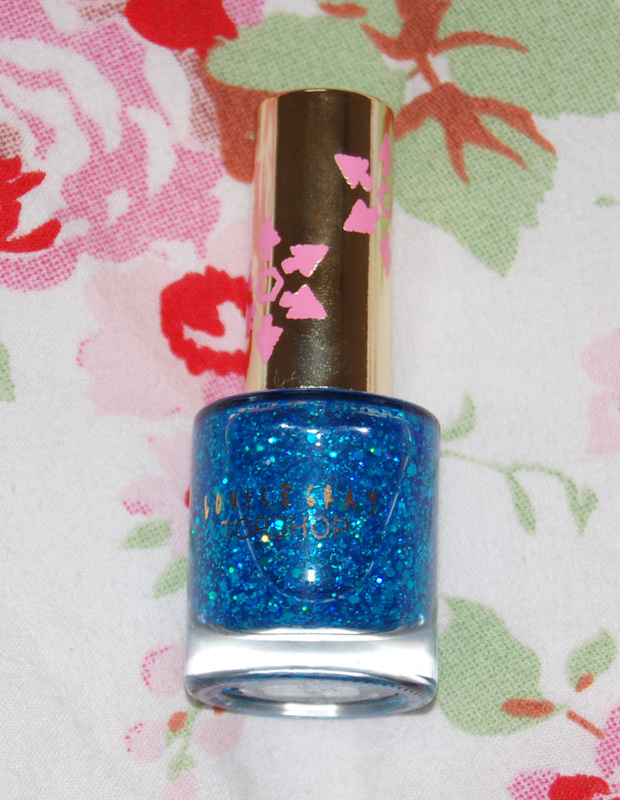 However, the nail polishes are what really caught my eye. Blue is a key colour this season, and instead of jumping straight to the eyeliner or mascara, I thought i'd start small with this pop of colour. 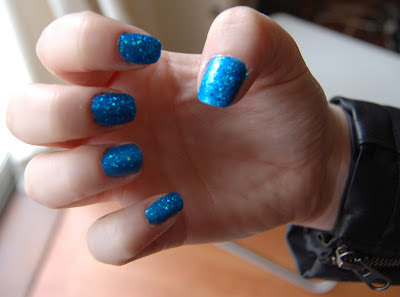 'Junk Yard' is a gorgeous electric blue mixed with different sized flecks of blue glitter. This polish can be worn alone or ontop of another polish, so in order to ensure the strength of the blue I generously applied two coats of 'Junk Yard' over Rimmel's I Love Long Lasting Finish in 'Azure' so my nails were thoroughly coated in glitter. They are quite attention grabbing, so be sure that your nails are of equal length and stay chip-free with a quality top coat - this shade isn't for the faint hearted! This is generally a gorgeous colour that also looks amazing on the shelf (I especially love the snowflake shapes on the bottle, it reminds me of christmas! 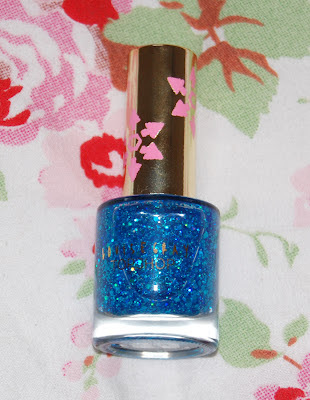 ), and for £6.50 i'll definitely be treated myself to the other shades in the collection. On a personal note, I attended the Louise Gray show at London Fashion Week today along with Mark Fast, it was my first show and I loved it - so fun, unique and playful, along with free champagne and Pixie Geldoff in the front row! I took plenty of snaps, so check out my twitter! You can purchase the Louise Gray Topshop range online here, or in your local Topshop store. About Me: 2nd Year University Room! September Obsession: Label. M Haircare!